Nerdy History people can learn a lot from the advertisements in early 19th century women's magazines. Unfortunately, while the magazines are easy enough to find online, only a few contain the advertising pages. This one came from one of those rare copies, the 1807 La Belle Assemblée. Using one system of valuation, £1 comes to about £70 in today's money (or about $110). Looking at value in terms of wages: The highest paid servant in a household, according to The Complete Servant, was "A French Man-Cook." 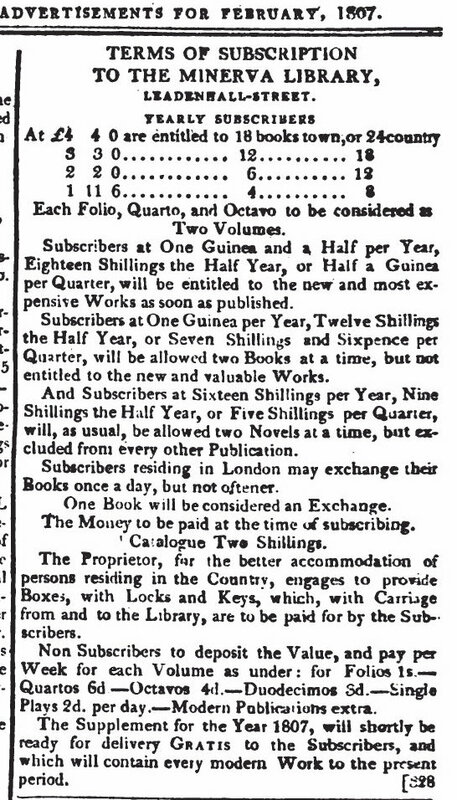 For this position, the authors recommend a salary of 80 guineas (£84) a year. At the other end of the scale, one of the lowest paid in the household, a nursery maid, got 7 guineas/year. 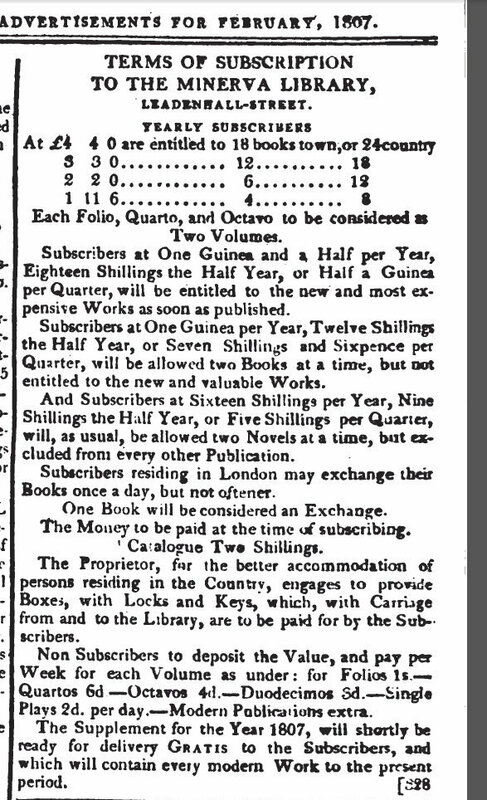 And this was in 1825, when wages had risen quite a bit. The cost of buying books and magazines was also quite high. 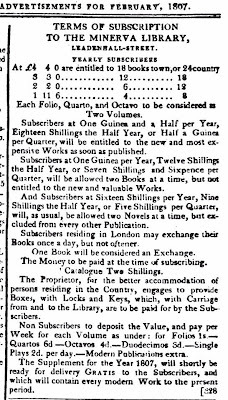 My little dog fancier's magazine from 1820 was 1s, and I've seen listings for books running from 3s.6d (The Castles of Athlin and Dunbayne, in boards) up to £4.6s (The Nature of Things, 2 vo embellished with engraved frontpieces, in boards), though most seem to be around the £1 mark. Note you could read a play for tuppence a day. Did borrowers see that as good value? Old canon plays could be had for sixpence although contemporary texts more expensive but nothing like novels. William Lane, proprietor of Minerva considered theatrical amateurs an important sector of library users.